In this presidential election season, one thing is certain: candidates will rarely – if ever – be asked what they would do to keep this nation at the forefront of science and innovation. Ultimately, the way we address science and innovation will determine what our children learn in school, what college graduates bring to the larger world, how public lands and natural resources are cared for and whether people receive adequate health care. And the list goes on. As the president of one of our country’s leading research university systems, I believe it is now incumbent on the academic community to ensure that the work and voices of researchers are front and center in the public square. When the voices of scientists are not heard in the dialogue, there is a price to pay. 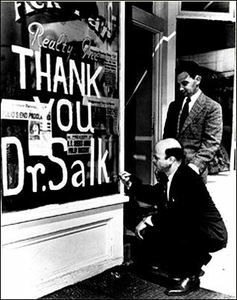 As Stanford University’s Charlotte DeCroes Jacobs made clear in her recent excellent biography, Jonas Salk, A Life, the fanfare brought Salk the everlasting disdain of some of his scientific colleagues, but it proved to serve the greater public good. It is important that scientists be seen as regular people asking and answering important questions. Our country needs more scientists who are willing and able to step out in the public arena and to weigh in, clearly and strongly – such as atmospheric physicist Veerabhadran Ramanathan of UC San Diego, who discovered the greenhouse effect of halocarbons in 1975. Dr Ramanathan is a member of the Pontifical Academy of Sciences that influenced Pope Francis to speak out on global climate change. Those of us in the academic community who are not scientists should also be prepared to support public engagement by scientists, and to incorporate scientific knowledge into our public communications. I know from conversations I have had with other higher education leaders that I am not the only one who believes this is important. Too many people in this country – and that includes some among our elected leadership – still do not understand how science works or why robust, long-range investments in research vitally matter. The truth is in the numbers. In the 1960s, the United States devoted nearly 17% of discretionary spending to research and development, reaping decades of economic growth from this sustained investment. By 2008, the figure had fallen into the single digits. This occurs at a time when the private sector has cut back on its research investment and other nations have made significant gains in their own research capabilities. China, for example, is projected to outspend the United States in research within the next decade. East Asia as a whole already does. At the University of California, we pride ourselves not only on the quality of our research, but also on its contribution to improving aspects of the world we live in. It is UC’s research, for example, that has made California among the most robust agricultural regions of the world. To hasten the development of science from the lab bench to the market place, UC is investing our own money in our own good ideas. This past summer, we launched the first primeUC competition, which will award US$300,000 to winning start-ups in the health sciences. And last year, our Board of Regents approved the creation of a new $250 million fund, designed to provide seed money for direct investment into student and faculty inventions. It also is possible to have some fun in demonstrating the broad, societal significance of research. Last May, I had the opportunity to emcee the first-ever University of California system-wide Grad Slam. The Grad Slam asked UC graduate students to take their years of academic toil and research, and present their work to an audience in just three minutes, free of jargon or technical lingo. Think of these presentations as TED talks on steroids or the ultimate in elevator speeches. Each of our 10 campuses held a local competition, and the finals took place at our system-wide headquarters in Oakland. Several of those finalists are featured on The Conversation’s website. While it was a fun event, the purpose was very serious. Good, sound science depends on hypotheses, experiments and reasoned methodologies. It requires a willingness to ask new questions and try new approaches. It requires one to take risks and experience failures. But good, sound science also requires clear explanation, succinct presentation and contextual understanding. Telling the story is half the battle, and Grad Slam is perfect practice. On the flip side, our country needs more politicians who understand science and recognize it as more than window dressing for photo ops at school science fairs or opportunities to come before the cameras in white lab coats. Scientists, of course, should not lose their focus on conducting research in the lab or the field, sharing knowledge with their peers, and supervising the postdocs and graduate students who will serve as the scientists of tomorrow. In today’s world, however, society will benefit from scientists who also are able to raise the profile of science in the public dialogue. To science, pilot of industry, conqueror of disease, multiplier of the harvest, explorer of the universe, revealer of nature’s laws, eternal guide to truth. The nation’s home of science in America. This is a fine, noble and trenchant statement of what science is all about. It is a statement that must be made to come alive in the nation’s public conscience, and in the public and political narrative. For more than 200 years, science and research have been the source of our country’s greatest strengths, and the promise of its bright future. Now more than ever, it is incumbent on scientists to put their knowledge on the table, and for others in the academic community to support them in that endeavor.